THE 2018 AIR RACE IS OVER! All the planning and organizing really paid off! The terminus events went beautifully! The many volunteers offered a warm welcome to all the racers. Celebrations went on for days. The Katahdin Wings 99s look forward to welcoming ARC Racers to the Lakes & Mountains region of Maine, when you land at Eastern Slopes Regional Airport – “Runway to the White Mountains.” You will enjoy a grand view of the White Mountains and several lakes in the area. As you approach your last flyby at Fryeburg, you’ll also catch a view of Lovewell Pond Sea Base. Fryeburg is among America’s earliest frontier towns and nestled in the foothills of the White Mountains. Today, it is a popular resort area attracting many tourists enjoying the great outdoors through all four seasons. It is a prosperous agricultural area of Maine and home to New England’s second largest fair, the Fryeburg Fair. Your Terminus hosts are planning an unforgettable weekend of events – the Meltdown Party celebration, Racer debriefings, and culminating in the 41st Annual ARC Awards Banquet. In between these events, check out your surroundings! 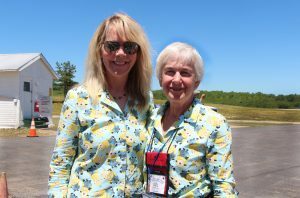 Brenda Thibodeau and the ARC Terminus Committee welcome Racers to Fryeburg, ME: T-07 Terminus Welcome Letter. Details for your ARC Terminus Weekend (including mandatory racer debriefings and events): T-06 Terminus Events. ALL racers – be sure that you are familiar with this schedule! We look forward to your arrival at the Terminus. Arrive by the Terminus deadline and plan for a great Meltdown Party to celebrate your race. ON THEIR 3RD PLACE FINISH! Their many New England Section supporters were on site to offer best wishes. 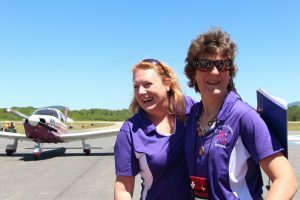 CT Chapter member Denise Robinson along with Teresa Camp participated in the Air Race as well. The Air Race Classic is the oldest race of its kind in the nation. It traces its roots to the 1929 Women’s Air Derby, in which Amelia Earhart and 19 other female pilots raced from Santa Monica, California, to Cleveland, Ohio. The 2018 race course had many weather challenges! Six of the nine flight legs were not used! Only three counted for scoring! Organizers report that the race course in 2018 will take racers through 15 states. At each of the eight intermediate stops teams will execute high-speed flybys over a timing line as they race against the clock. Race officials report that each plane receives a unique handicap. Teams are racing against their own best time, not against one another. Teams strategize to play the elements, holding out for better weather or seeking more favorable winds, to beat their handicap by the greatest margin, officials explain. Women’s air racing all started in 1929 with the First Women’s Air Derby. Twenty pilots raced from Santa Monica, CA to Cleveland, OH, site of the National Air Races. Racing continued through the ’30’s and was renewed again after WWII when the All Women’s Transcontinental Air Race(AWTAR), better known as the Powder Puff Derby, came into being. The AWTAR held its 30th, final and commemorative flight in 1977. When the AWTAR was discontinued, the Air Race Classic, Ltd., (ARC) stepped in to continue the tradition of transcontinental speed competition for women pilots and staged its premier race. The Air Race Classic was reincorporated in 2002 into the Air Race Classic, Inc., a non-profit 501(c)3 organization. The early air races were the “on to” type, with noon and night control stops, and the contestants more or less stayed together. In that manner, weather and flying conditions were practically the same for each entrant and the race officials could release standings to the media after each day of racing. The current race routes are approximately 2,400 statute miles in length, and the contestants are usually given four days, flying VFR in daylight hours, to reach the terminus. Each plane is assigned a handicap speed – and the goal is to have the actual ground speed be as far over the handicap speed as possible. The pilots are thus given the leeway to play the elements, holding out for better weather, winds, etc. The objective is to fly the “perfect” cross-country. In this type of race, the official standings cannot be released until the final entrant has crossed the finish line. Actually, the last arrival can be the winner.